Progressive Party of Maldives (PPM) has announced an extraordinary People’s Majlis sitting to vote on the President’s Decree for State of Emergency will be held at 4 pm this Tuesday, and has issued a three-line whip to ensure the Decree passes. The three-line whip was issued at the joint-parliamentary group meeting held by PPM and Maldives Development Alliance (MDA) this Tuesday afternoon. President Abdulla Yameen Abdul Gayoom has requested approval for the 15-day State of Emergency announced on February 5, and a 30-day extension to the State of Emergency. The request was sent to the National Security Committee of the Majlis for evaluation during the extraordinary sitting held last Monday morning. The National Security Committee held a closed meeting to deliberate of the request in the afternoon, and provided its approval for the Decree and the 30-day extension. 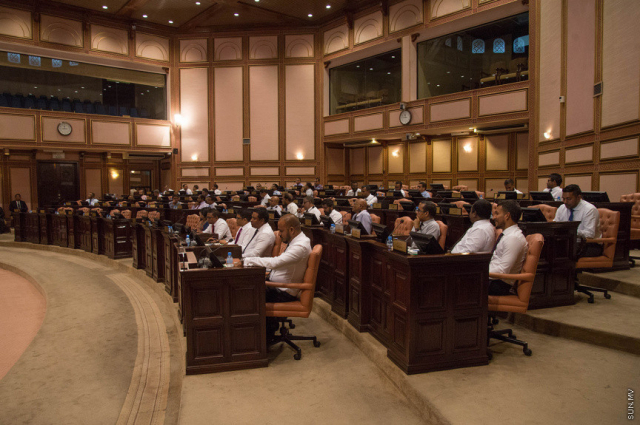 Opposition MPs have stated a vote to pass the Decree, therefore, cannot be taken without at least 43 MPs present at the Majlis. Monday’s extraordinary sitting was boycotted by all opposition MPs, and the Decree was accepted into the Majlis for consideration and sent to the National Security Committee for evaluation with the vote of 39 pro-government MPs present at the sitting. Opposition MPs have challenged the government, claiming the government will not be able to gather 43 MPs needed to hold the vote. However, a PPM MP who spoke to “Sun” said the party has received legal advice 43 MPs do not need to be present in order for the vote to take place. It is unclear whether or not opposition MPs will be boycotting this Tuesday’s extraordinary sitting as well. But the MPs have publicly protested against extending the State of Emergency.